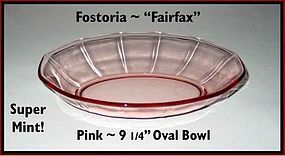 This Fostoria pink Fairfax 9" Oval Baker is in MINT unused condition and is a beautiful color! 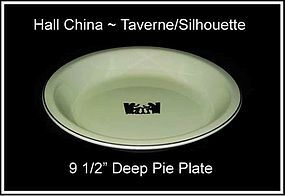 You almost never find these bowls in this condition. 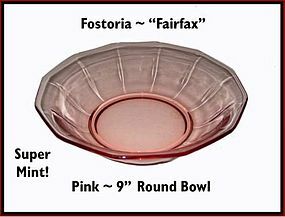 This Fostoria pink Fairfax 9" round bowl is in MINT, unused condition and is a beautiful color! 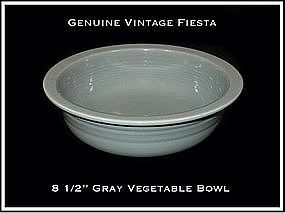 You almost never find these bowls in this condition. 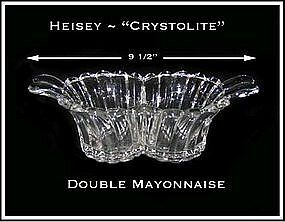 Years ago we had a complete butter dish like this one with a top. 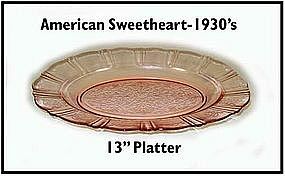 It had crystal lid that had a English Hobnail type of pattern on it and was very high quality. It's possible that this is Imperial or maybe Westmoreland. We just know that someone out there needs this base. 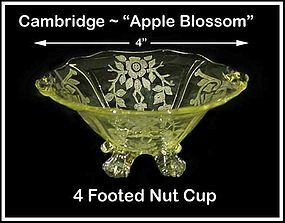 This yellow Apple Blossom 4 footed nut cup was made by The Cambridge Glass Co. in the 1930’s. It is in excellent condition. Please let us know how many when you order. We will gladly combine shipping on multiple purchases. This ruby flashed cut to clear dinner bell is very high quality. 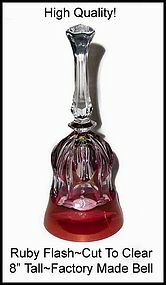 It is factory made and very bright and shiny high quality glass. 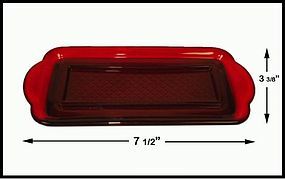 There are 6 panels and they are cut through the ruby flashed part to the clear. There are tiny gripping cuts on the handle for safe handling. This bell is Heisey Quality or better. There are a couple of small scratches on the ruby flashing. No damage to glass. 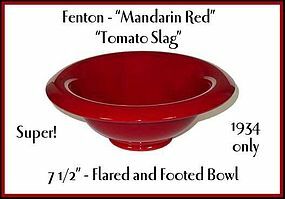 It would go well with any Ruby Flashed Pattern! 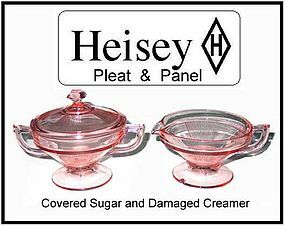 This Heisey Pleat & Panel Flamingo color creamer, sugar and lid are beautiful! The creamer has a chip on the foot that can be seen in the photo. 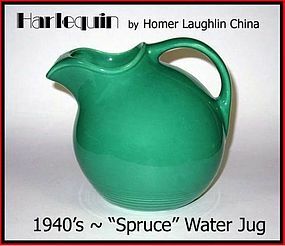 The sugar bowl and lid are in excellent condition. 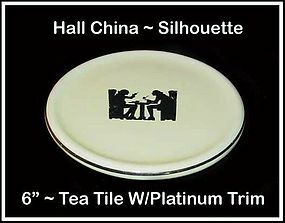 The lid is signed with the Diamond H on the underside. Beautiful color! These rolled edge pink Royal Lace candles are hard to find. One of them is mint, and the other one has a crack but is very usable. The price reflects the damage. 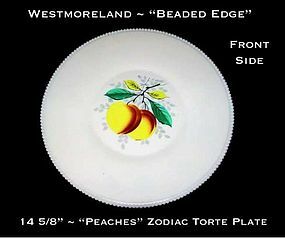 This 14 5/8" Zodiac plate with Peaches on the front was made by Westmoreland and is in excellent condition! The back side has the 12 Zodiac signs on it. 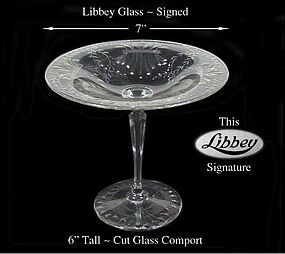 Libbey Glass 1930s Cut Glass 6" Compote - Signed-Nice! 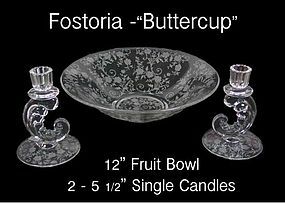 This vintage cut glass Libbey comport compote is in excellent condition. 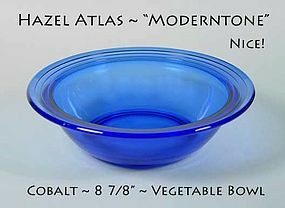 It was made by The Libbey Glass Co. in the 1930s-1940s It is signed with the logo shown in the photo insert. Unusual to find these marked.